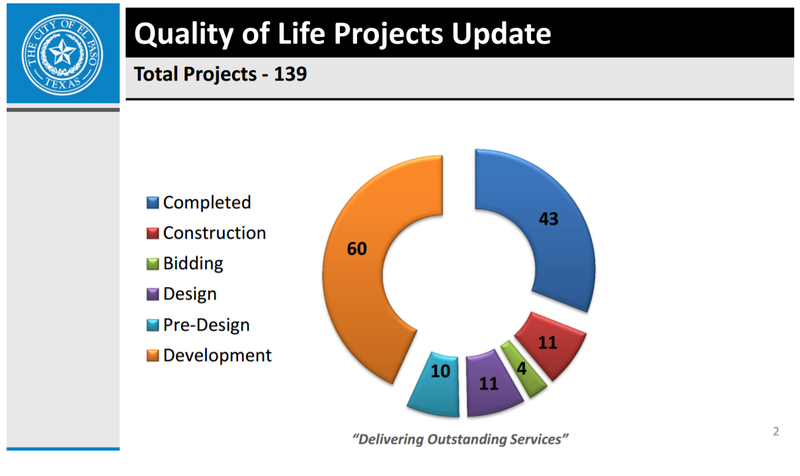 We’re finally getting to see an update on the quality of life projects that we approved back in 2012. At their rate of four years for 43 projects they will be at this for another 12 years. They don’t tell us when the rest of the projects will even be started. The neighborhood Chelsea pool is a tragic example. Elsewhere in the presentation we learn that it is still in the design phase. This is a situation where the neighborhood had a swimming pool but the city closed it. Now years later they still have not replaced it. On the west side of town a brand new aquatic center is already under construction–right next to an existing pool that still serves the neighborhood. This entry was posted on Sunday, December 18th, 2016 at 5:00 AM and is filed under City government. You can follow any responses to this entry through the RSS 2.0 feed. You can leave a response, or trackback from your own site. And by “pre-design” they mean looking for neighborhoods in DTEP to plow under. A children’s museum isn’t even in the design stage? AAA still trumps STEM.